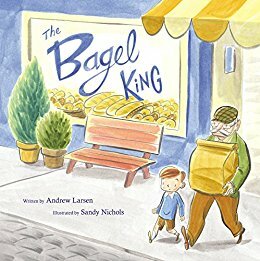 Andrew Larsen is the author of the new children's picture book The Bagel King. 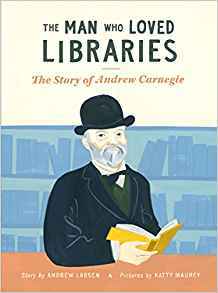 His other books include A Squiggly Story and The Man Who Loved Libraries. He lives in Toronto. Q: In our previous Q&A, you noted that The Bagel King was inspired by your father-in-law. Can you say more about that? A: My father-in-law was an extraordinary grandfather. He worshipped his grandchildren and they, in turn, revered their Zaida. This is his third appearance in one of my books. He also inspired Poppa in The Not-So-Faraway Adventure and Poppy in Dingus. Every Sunday morning he would wake up extra early and get in his car with Rupert, his wirehaired terrier. They would drive to Zaida’s favourite bakery. He would pick up the dozens of bagels he had ordered the day before; always well done. He would drive to each of his grown children’s houses. He would knock at the front door and leave a bag of warm bagels, getting back into his car before we had a chance to answer the door. Then he would return home to his wife and they would share their own Sunday morning breakfast of fresh bagels and pickled herring. One Sunday morning he stopped delivering the bagels. It was months later, when my mother-in-law resumed the tradition, that I knew I had to write a story. Q: What do you think the story says about grandparents and grandchildren? A: The bond between a grandparent and a grandchild has the possibility of being different than the bond between a parent and a child. It has the possibility of being richer and more nuanced. In The Bagel King, Eli learns that his Zaida is an integral part of a longstanding tradition. Eli, in turn, does what he has to do to keep that tradition alive. The connection between grandparents and grandchildren is vital in connecting the past with the future. Its emotional resonance can be profound. My children have been lucky to have such wonderful grandparents. Q: What do you think Sandy Nichols’ illustrations add to the story? 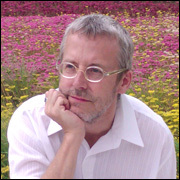 A: I am so very fond of Sandy Nichols’ work. Her illustrations for the story seem timeless. They capture its essence perfectly. My father-in-law would have loved it! A: I hope they realize that their grandparents might have very full lives beyond the life they share with their grandchildren. I hope kids realize that they can make a positive difference in the lives of their grandparents and can truly help out when their grandparents are in need. I also hope they learn that even little traditions can be very important. Finally, I hope they learn that there are many ways to enjoy bagels. A: I am putting the final touches on a picture book that is due out next spring. I’m also working on a baseball picture book. I love to write about the things I love and I love baseball. --Interview with Deborah Kalb. 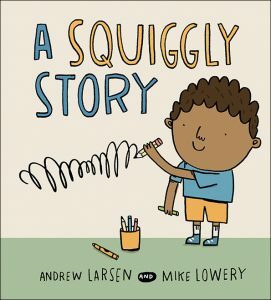 Here's a previous Q&A with Andrew Larsen.